The Corporation for Education Network Initiatives in California (CENIC) has established five new 100 Gbps links between the California Research and Education Network (CalREN) and Internet2. Two new 100G connections in Los Angeles will support a variety of research purposes, along with a third 100G connection at Sunnyvale that will also connect to Internet2’s Advanced Layer 2 Services. Along with these, two connections between CalREN and Internet2’s TR-CPS national peering infrastructure will be upgraded to 20G and can scale to 100G. CenturyLink's Savvis division announced the global availability of Savvis Cloud Data Center, a virtual data center service built on VMware vCloud Director 5.1 and Cisco's Unified Data Center technologies. 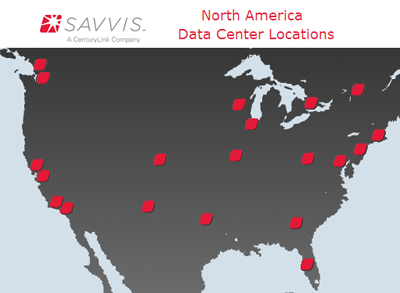 Savvis Cloud Data Center enables business clients to build software-defined data center services that manage compute capabilities, storage, network connectivity and security operations. Savvis said VMware vCloud Director 5.1 simplifies workload migration and integration, while standardizing on Cisco's Unified Computing System (UCS) taps the full potential of virtualization and cloud platforms through total infrastructure abstraction and API-driven automation. "Businesses are looking to migrate applications hosted on-premise into the cloud using a variety of hybrid solutions," said Andrew Higginbotham, chief technology officer at Savvis. 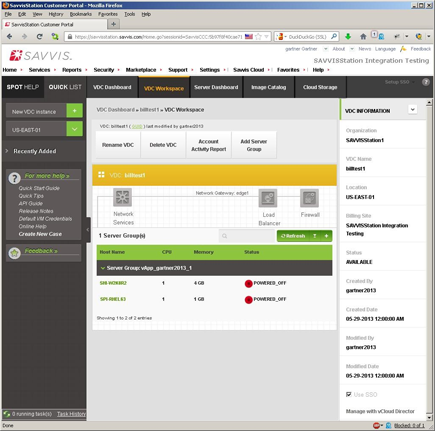 "Designed for customers who rely on VMware technologies, Savvis Cloud Data Center streamlines extensions into the cloud with easy-to-use familiar interfaces and tools for scaling performance to their needs." "Savvis is a partner that understands how to use VMware technologies to help companies build, deploy and manage critical business solutions," said Dave O'Callaghan, senior vice president of Global Channels and Alliances, VMware. "Cloud Data Center, built on vCloud Director 5.1, can provide businesses with a simple and flexible platform for hybrid cloud delivery that enables control and choice on where to run applications and effective asset protection through true data center extensibility." "Savvis has consistently demonstrated its leadership in providing high-value cloud, network and managed hosting services. Cloud Data Center further reinforces this position and our longstanding partnership," said Giuliano Di Vitantonio, vice president, data center and cloud solutions marketing, Cisco. "The integration of Cisco's Unified Data Center technologies, such as UCS and Unified Fabric, gives Savvis Cloud Data Center end-users the dynamic infrastructure foundation they need to build, manage and connect public, private and hybrid clouds in a secure and efficient manner." AppliedMicro introduced its new family of X-Weave data center connectivity chipsets, spanning 100 Gbps to 240 Gbps with integrated analog I/O for a variety of optical and copper connectivity interfaces. The X-Weave product family is specifically designed to meet the unique needs of public cloud, private cloud, and enterprise data centers. The idea is span rack and cluster resources within the data center, and then to seamlessly connect multiple data centers together over DWDM optical links. The first product in the family is X12: AppliedMicro's 28 nanometer, 120G, 12-port Ethernet/OTN "smart PHY" with framer, mapper, and multi protocol DSP-based forward-error correction. "X-Weave was co-created with top tier service provider and data center customers and uniquely leverages our established position in the service provider market to address the rapidly growing data center market. The convergence of X-Gene™ and X-Weave will offer a full portfolio of components for the new cloud infrastructure and will position us well to execute on our growth strategy," said Dr. Paramesh Gopi, AppliedMicro's President and CEO. NTT Communications will establish a presence in CoreSite's Silicon Valley and Northern Virginia data center campuses. It will also expand its presence at CoreSite's Chicago and Los Angeles (One Wilshire) facilities. 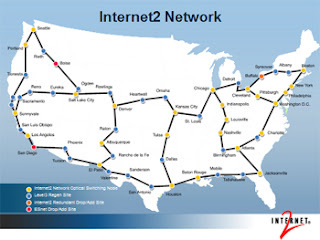 CoreSite's data centers in Silicon Valley, Los Angeles, Chicago and Northern Virginia will provide NTT Communications with access to the CoreSite Mesh, including more than 750 national and international carriers, cloud computing providers, networks, content and service providers, financial trading firms, CDNs and systems integrators. "The facilities we choose to connect into directly impact the growth of our customer base," said Michael Wheeler, Executive Vice President, NTT America. "NTT Communications has had a successful relationship with CoreSite in Los Angeles and Chicago. We are excited to expand our presence in those locations, and extend our footprint with CoreSite into Silicon Valley and Northern Virginia in order to reach a broad community of internet-centric businesses." "NTT Communications operates one of the world's largest Tier-1 global networks," said Jarrett Appleby, COO, CoreSite. "Today's announcement brings tremendous value to our ecosystem of customers. It delivers direct access to NTT Communications' network through four of our key data center campuses and increases the global connectivity options available to customers across the CoreSite Mesh." Telefónica Group’s revenue for the first half of 2013 totalled 28,563 million euros, marking a return to growth in organic terms for the first time since the first quarter of 2012, as revenues increased 0.5% year-on-year during the second quarter of 2013. The results were driven by a strong acceleration in Latin America, which grew by double-digits in the same period (+10.4% yoy in organic terms), and improving trends in Europe. At the end of June, OIBDA reached 9,421 million euros (-0.4%) and the company maintained high levels of profitability with an OIBDA margin of 33%. The company said these results are in line with its internal estimates, allowing it to reaffirm annual operating and financial targets. At the end of June, the Telefónica Group’s customer base reached 317.3 million accesses (+2%) out of which more than 78% are mobile accesses (249.5 million). 2.1 million net mobile contract customer additions in Q2, resulting in mobile contract customers already amounting to 85 million (+8.1%). Smartphones already reached a penetration rate of 24% of mobile accesses. During Q2, Telefónica launched its first Firefox handsets. Between January and June 2013, the company invested 3,903 million euros, including 834 million euros for purchasing spectrum in the United Kingdom, Uruguay, Spain and Brazil. 84% of the total investment effort was allocated to growth and transformation activities. Mobile accesses stood at 249.5 million, up 2% compared with June 2012, driven by the contract segment, which accelerated its growth to 8% year-on-year and now accounts for 34% of total mobile accesses The Company strengthened its position in this high value segment and during the second quarter ramped up its pace of customer capture and commercial activity, particularly in smartphones, with net contract additions of 2.1 million, the highest since the third quarter of 2011. Mobile broadband accesses stood at 63.3 million at the end of June, posting the largest year-on-year growth since the second quarter of 2012 (+41%), almost 7 percentage points higher than the first quarter and increasing its penetration rate up to 25% of mobile accesses (+7 percentage points year-on-year). This strong commercial activity continued to be underpinned by the significant increase in smartphones, with a record of 8.2 million net additions in the quarter, three-fold the figure in the first quarter and more than double the figure in the same period of previous year. The smartphone penetration rate stood at 24% of mobile accesses in June 2013. Retail broadband accesses totalled 18.3 million at the end of June and improved its growth up to 2% excluding the impact of the sale of the assets of the fixed business in the UK. Net additions in the quarter stood at 165 thousand customers, 4.4 times more than in the first quarter and 1.9 times more than in the same period of 2012. 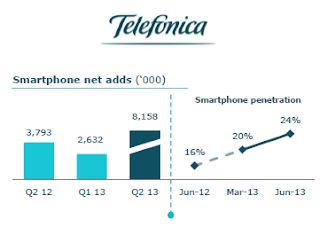 The acceleration in commercial activity in the quarter was mainly driven by Telefónica Latinoamérica, with mobile contract net adds rising by 44% compared with the first quarter of 2013 and by 64% compared with the second quarter of 2012, reflecting the focus on high-value customers, especially on smartphones. There was also a marked improvement in the operating performance of the fixed business, mainly driven by broadband, with net adds in the quarter 1.6 times higher than in the January-March period, to reach 214 thousand accesses. By region, Telefónica Latinoamérica is the Group's growth engine, accounting for 51.4% of consolidated revenues in the first half of the year while Telefónica Europe and Telefónica España's contributions fell to 46.9% and 23.0%,respectively. Mobile data revenues rose 9.8% year-on-year in organic terms (+9.6% in the first half) and accounted for 36.4% of mobile service revenues in the year (up 3 percentage points compared with the first half of 2012). Non-SMS data revenues growth ramped up sequentially to 22.1% year-on-year in organic terms (+22.0% in the half year) and now account for 63% of total data revenues. The average headcount was 131,882 employees, down slightly compared with the first half of 2012 (-3.5%). CapEx in the first half totalled 3,903 million euros (+6.7% year-on-year) and included 834 million euros relating to the acquisition of spectrum; in the UK (671 million euros) and Uruguay (24 million euros) in the first quarter and in Spain (65 million euros), the UK (47 million euros) and Brazil (28 million euros) in the second quarter. The OpenDaylight Project , a community-led and industry-supported open source framework to advance Software-Defined Networking (SDN), announce a set of accepted technical contribution networking protocols to virtualization to security. OpenDaylight reviewed and accepted contributions from Cisco, ConteXtream, Ericsson, IBM, NEC, Pantheon, Plexxi, Radware and developers Brent Salisbury and Evan Zeller from the University of Kentucky. The base architecture for the OpenDaylight controller is a combination of two code bases that were brought together through a collaborative proposal by Colin Dixon of IBM and David Erickson of Stanford. Shortly thereafter, NEC contributed a key feature with its Virtual Tenant Networking technology. Affinity Metadata Service: Contributed by Plexxi, this service provides an API allowing the OpenDaylight controller and higher-level applications to create and share an abstract, topology and implementation independent description of the infrastructure needs, preferences and behaviors of workloads that use the network to "talk" to one another. BGP/PCEP protocol library: The Cisco-contributed library provides Java-based implementation of the Border Gateway Protocol (BGP) and the Path Computation Element Protocol (PCEP). Defense4All: Radware contributed this toolset to be used for the detection and mitigation of Distributed Denial of Service (DDoS) attacks. Defense4All subsystems include statistics collection, anomaly detection, traffic redirection and mitigation management that together allow applications to leverage the OpenDaylight controller and an SDN architecture to effectively manage DDoS attacks. LISP Mapping Service: ConteXtream contributed its Locator/ID Separation Protocol (LISP) Mapping Service and protocol plugin. The LISP protocol enables separation of endpoint identity (EID) from routing location (RLOC) by defining an overlay in the EID space that is mapped to the underlying network in the RLOC space. LISP is also a mapping service that provides the EID-to-RLOC mapping information including forwarding policy to LISP routers for tunneling and forwarding purposes. In the context of network virtualization, a mapping service can be queried by LISP-enabled network devices to provide mapping of the virtual network endpoints to the underlying physical network, including the associated forwarding policies. Open DOVE: IBM contributed a version of its established network virtualization technology, called Distributed Overlay Virtual Ethernet (DOVE), that provides isolated multi-tenant networks on any IP network in a virtualized data center allowing administrators to define virtual switches and networks, Quality of Service, security, bandwidth, priorities and more. DOVE provides each tenant with a virtual network abstraction providing Layer 2 or Layer 3 connectivity and the ability to control communication using access control policies. Address dissemination and policy enforcement in Open DOVE is provided by a clustered directory service. It also includes a gateway function to enable virtual machines on a virtual network to communicate with hosts outside the virtual network domain. OpenFlow 1.3.0 Protocol Library: Pantheon’s contribution is an implementation of the OpenFlow protocol as defined in OpenFlow Switch Specification Version 1.3.0. The library is designed to be extensible from third-party bundles in order to support vendor extensions and should serve as a basis for the OpenFlow 1.3.0 southbound plugin for the OpenDaylight controller. OpenFlow Plugin: Cisco, Ericsson and IBM combined efforts to create a common, uniform OpenDaylight plugin to support all implementations of the OpenFlow specification as it develops and evolves. It provides support for the existing OpenFlow 1.0 implementation, while aiming to support OpenFlow 1.3.x and further versions of the specification. It will be implemented in a way that existing and future OpenFlow protocol specifications can be integrated and published for the OpenDaylight controller. Open vSwitch Database Management Protocol (OVSDB) is a project led by Brent Salisbury and Evan Zeller from the University of Kentucky. Open vSwitch is an open source software project implementing virtual switching that is interoperable with many major hypervisors and used extensively in cloud computing environments. The OVSDB integration project will allow OpenDaylight to view, modify and delete Open vSwitch objects such as bridges and ports by way of the Open vSwitch database. YANG Tools: This is an infrastructure project initiated by Cisco aimed at developing necessary tooling and libraries providing ubiquitous support for YANG as a data modeling language within OpenDaylight. "Community growth for OpenDaylight has been astonishing with hundreds of developers now contributing their time and talents for the advancement of SDN. Everything is starting to congeal between the contributions and the people working fast and furious to build what we expect will be industry leading SDN technology," said David Meyer, Technical Steering Committee chair, OpenDaylight Project. “The steady growth of the corporate member base is ensuring that we have a solid financial foundation from which to operate. It's an exciting time to be involved with SDN." 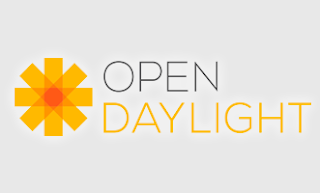 OpenDaylight also noted that its membership roster has grown to 27 companies since launch. Ikanos Communications has achieved an aggregate throughput of 300Mbps over a standard single-pair copper cable up to a distance of 200 meters (short-loop) using its existing VDSL chipsets. Ikanos described the short-loop demonstration as a significant step towards G.Fast. The demonstration follows recent, multiple top-tier OEM and carrier lab trials in which the company’s Velocity-3 central-office (CO) chipset was been given high marks for achieving 150Mbps aggregate throughput (110Mbps downstream and 40Mbps upstream) at a distance of 500 meters in a 192-port reference DSLAM system. CloudSigma, the Switzerland-based provider of pure-cloud Infrastructure-as-a-Services (IaaS), is dropping its compute pricing for customers to reflect the efficiency gains from its recent public cloud 2.0 upgrade. 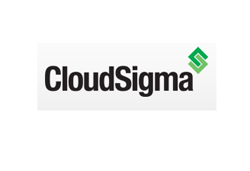 Specifically, CloudSigma’s RAM pricing is being reduced by 20 percent and its CPU pricing is decreasing by 15 percent across all locations for both subscription and pay-as-you-go burst pricing. EarthLink inaugurated its newest data center -- 50 NE 9th Street in Miami. The new facility features EarthLink's next-generation cloud hosting platform, which will enable the company to deliver highly-secure, comprehensive IT solutions including cloud hosting, Cloud Workspace, managed security, colocation, Cloud Server Backup and application solutions in South Florida. In addition to Miami, EarthLink recently opened data centers in San Jose, Chicago and Dallas. Combined with EarthLink's current data centers in Pittsford, NY; Marlborough, MA; Columbia, SC and Atlanta, EarthLink now operates eight data centers linked to its nationwide IP network. "Miami is one of the country's technology hotspots and a vibrant, growing market," noted Michael D. Toplisek, EarthLink Executive Vice President of Sales and Marketing. "A vital communications hub for IP traffic, Miami also serves as a gateway to Latin America and beyond. Adding a robust, new state of the art data center in the city enables EarthLink to easily scale to support our customers' current and future IT service demands as they seek to virtualize their businesses." CoreSite Realty Corporation reported Q2 operating revenue of $57.7 million, representing a 13.9% increase year-over-year. CoreSite had 236,673 NRSF of data center space under construction at four key locations as of June 30, 2013. The projects under construction include new data centers at SV5 (San Francisco Bay area), VA2 (Northern Virginia area), NY2 (New York) and additional inventory at LA2 (Los Angeles). As of June 30, 2013, CoreSite had incurred $59.4 million of the estimated $188.0 million required to complete these projects. SolidFire, a start-up based in Boulder, Colorado, announced $31 million in Series C funding for its all-SSD storage systems designed for large scale cloud infrastructure. SolidFire's newly launched SF9010 is an all-flash, scale-out storage system designed for large scale public and private cloud infrastructures. At full scale (100 nodes) the SF9010 provides 3.4PB of effective capacity and 7.5 million IOPS. SolidFire said customers building storage infrastructure from 60TB to 3.4PB can now do so below $3/GB and below $1/IOPS. Along with the SF9010, SolidFire also released SolidFire Element OS Version 5, which adds VMware VAAI and VASA support, full encryption-at-rest without performance impact, and more detailed per-volume and per-tenant performance reporting. The new financing came from Samsung Venture Investment Corporation (Samsung Ventures) and insiders. Samsung Ventures joined existing investors NEA, Valhalla Partners, and Novak Biddle Venture Partners. "The SF9010 really highlights SolidFire's storage architecture in action," said SolidFire Founder and CEO Dave Wright. "The system is incredibly flexible and is designed to consume the latest flash technology available. This enables us, and our customers, to keep pace with the rapid advances in the flash market and take advantage of falling cost and rising density. The SF9010 takes us across the threshold of flash becoming lower than the cost of performance disk." Applied Micro Circuits Corporation (AppliedMicro) reported Q1 FY2014 net revenues of $54.1 million, down 4.0% sequentially and up 31% year over year. Q1 FY2014 non-GAAP EPS was $0.02 per diluted share on net income of $1.4 million, compared to $0.00 per diluted share on net income of $0.1 million, for the fourth quarter of fiscal 2013. The company confirmed that its X-Gene Server on a Chip product continues to be on track for commercial production as indicated by key customers' systems-development commitments. "We had an excellent quarter, where we had strength in our base business and also continued to make significant progress towards getting our revolutionary and category defining X-Gene server platforms to market," said Dr. Paramesh Gopi, President and Chief Executive Officer. Shiva Natarajan, interim Chief Financial Officer, commented, "We had a great quarter where we achieved better than expected non-GAAP results. We expect to continue to execute solidly as we position ourselves for the growth we anticipate in the future".